BCB: Who was the toughest defensive lineman you faced during your time at South Carolina? Nunn: "Melvin Ingram, Clowney, Da'Quan Bowers, Cliff Mathews, Kelcey Quarles, Ricky Sapp, "Mount Cody", Greg Hardy (Ole Miss currently with the Carolina Panthers), Jermaine Cunningham (Florida that started for the Patriots), Devin Taylor, Carlos Dunlap (Florida on Cincinnati), Byron Jerideau, Lindsey twins, Brinkley brothers & Chaz Sutton." BCB: Lattimore would always credit the O-line, talk about the offensive line relationship with the running back position and what was it like playing with a teammate like Lattimore? Nunn: "He was a Heisman trophy candidate, enough said. You've seen his Education Lottery commercial, his o-line didn't do anything." BCB: Talk about your experience trying out for the Jets what were some negatives and positives you took away from the experience? "It's what you do when adversity strikes that determines the outcome of your triumphs and faults. With the right opportunity anything is possible." "I'm very grateful that I'm going to have the opportunity to show what God has given me in front of potential scouts and run in the Atlanta Falcons practice facility. It would be really nice to play with ex Gamecock teammates Cliff Mathews, Travian Robertson & Pat Dimarco again." BCB: You've at a lot of high and low points in your career at South Carolina with injuries, what kept you motivated to keep pushing and who on the team helped you the most? Nunn: "Lemuel Jeanpierre, Terrance Campbell, TJ Johnson, Garret Chisolm, Jarriel King, Hutch Eckerson and all of my coaching and strength staff, Fitz, Jo, Coach "Black Iron" Smith, Coach Austin and company during my time at the University." BCB: What's that one play or key block during a game that you'll always remember? Nunn: "l have had many favorite memories but if I had to choose one it was either coming back from back surgery and going against Melvin Ingram and Clowney in one on ones just a few weeks after surgery in the Capital One Bowl practice or knocking Marcus into the end zone with TJ Johnson at the 2010 Florida game to clench the Eastern Division Title. We were in the end zone gator chomping on the field as the blue disappeared and the black and garnet roared from the upper deck in the Swamp." BCB: What's something that may have happened behind the scenes during your time at South Carolina that Gamecock fans may not know? Nunn: "People only see as far as the eyes can see on Saturdays, they don't know or care about struggles and temptations that players are introduced to when playing for a successful college football team as long as your score is higher than whoever the opponents are. I experienced a blood clot because of herniated L4 L5 discs that pinched my nerves and played in a back brace at Carolina vs Vanderbilt because of my injury I had against Navy in the first half." "There's nothing like sitting in class in pain, in a back brace, dragging your leg from your Saturday wear and tear you endured during the Vanderbilt game and getting a pat on the back from a classmate or a "atta boy" or "good game" from Professor Miles and Professor Moody in the retail department. But, being told you have to study and maintain a constantly moving structured schedule with the football program, study hall, weight lifting and mandatory meals after having a high school I'm on top of the world mentality with reality. Because, at times there are people that get put on a "god like" position mentally, Coaches push you to play, your body pushes you to rest and your mind says you can't let your teammates down. Football is a double edged sword that makes and breaks high school, college and professional athletes." 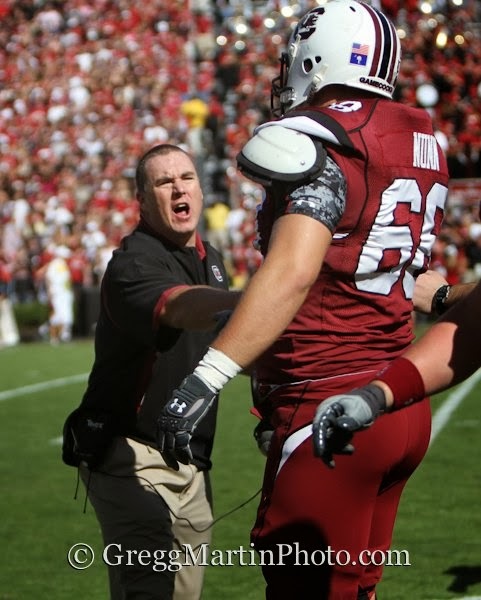 BCB: You've had multiple o-line coaches at South Carolina, which coach had the biggest impact on you and why? Nunn: "All of which did have an impact on me differently, but any and all success on the college level and what I know today in arena football and with my mini camp with the jets I owe it to them. All of these opportunities came because of the great coaching and family support back home and I appreciate all of it. I was hoping for a fair shot at getting coached by an offensive line coach in the NFL, while training at CES (Competitive Edge Sports) I had an opportunity to work with Larry Bechtel that coached for the Green Bay Packers and many other great mentors." "It made me think about how much more that could be done to help players adapt from that busy schedule after graduation and NFL mini camp. Guys that have go through the free agency process and those who have to play Arena or CFL but want to live the NFL lifestyle. I've had to bounce coach at Heathwood Hall and do construction work for family members, doing house repairs or run errands and do things for my mom Linda Schermerhorn & Grandma Joy Griffin since graduation in between workouts camps and arena football because good jobs want you to train for at least a month or take a lesser starting pay and work your way up but in between seasons." "You have to have flexibility in a job to be able to train and more of a transition period between being loved by the world to being in Kenny McKinley, Kenny Miles or any other athletes that struggle w post college injuries or depression. If you aren't say a Marcus Lattimore, an all SEC running back so to speak. I don't want to sound spiteful but I can't get an NFL workout because of a simple back injury and I've been 100% healthy since 7 weeks post surgery a couple years ago. It bothers you watching guys you blocked and played with in the NFL saying, Gosh, I blocked the crap out of him or I pancaked him but it's being considered cocky or spiteful if you speak of what could have been or should have been." BCB: Take us back to that moment when the doctors told you that you were done with football and the journey all the way to your return to the Capital One Bowl in which you earned All-SEC Bowl Team Honors. Nunn: "It was an emotional roller coaster, hard work, family support and collective dedication among all of which that brought me to where I am. With my teammates support and the training staff at South Carolina and Dr. Brigham (Surgeon at Ortho Carolina) that also works for the Panthers, helped me recover from surgery in 7 weeks time with his small incision and their training program and rehabilitation, conditioning and weight lifting all day for many days in a row, I was able to get back to practice for the bowl game and show everyone I was healthy against Nebraska." BCB: What's something you'll always remember about coach Spurrier, what was the meeting like when you first met him? Nunn: "Immediately I was star struck, but once I realized how much we had in common and he told me that he saw greatness in me and that I could possibly be a four year letterman, I knew it was a good fit because he is a perfectionist . Him and his coaching staff coached us up. It was rough at times and he pushed me past the breaking point to get me out of my comfort zone in order to make me a better person and football player." BCB: What are doing now to prepare for another shot at the NFL, are you participating in the regional NFL Combine? BCB: What's something you'd like to tell all of Gamecock Nation? Nunn: "I love ya'll and all of the support that I've had throughout my career and always remember, 5 times in a row isn't a coincidence for the state championship as its been deemed by the HBC. Anymore, it's a reality we are better than the other team that wears orange and purple on game day in this state and I'm proud to have been able to play a part in turning our football program into a "new chapter" or a new Carolina. Three 11 win seasons is not a coincidence, I just hope that Gamecocks in the future keep the ball rolling to a National Championship or SEC Championship at the least."